One of my fellow forumer, Vivian, shared with us this wonder recipe adapted from Alex Goh's book. Her cake photo look so good that I was really tempted to try out this recipe. So despite coming back late from office, I still went and grab my cream cheese from NTUC and rushed home immediately to do my baking. Reached home at 9 pm but thankfully, by 9.30 pm the cake was already in the oven baking away. The texture of the cake is really very soft and the taste is good. Here is how the cake look. The recipe is adapted by a friend from Alex Goh's "Fantastic Cheesecakes". 2. Cook (A) over double-boiler until well blended and thickens. Remove from double-boiler and let it cool down. 3. Add (C) into cooled down cheese mixture and mix until well combined. 4. Fold in (B) and mix until smooth. 5. Beat egg whites until frothy, add cream of tartar and beat till soft peaks. Add salt and sugar and beat till stiff peaks. 6. Fold 1/2 of the egg whites into cheese mixture, gently with a rubber spatula until just blended. 7. Pour cheese mixture (step 6) into the rest of egg whites, fold it gently with rubber spatula until blended. 8. Put batter into a 9-inch chiffon cake pan, bang the pan on a hard surface to release the bubbles and bake for 35 - 40 minutes. wow..reached home 9pm you still want to start your baking?? and just spend 30 min for such a nice cake, that's the reason why you are so successful, for me, I will just sit in front of the TV, really admire and want to learn more from you.. It's look so soft and spongy. It must be tasting good too. hi hugbear, i am Alex Goh's fans too. his recipes and ideas are really professional and inspiring. 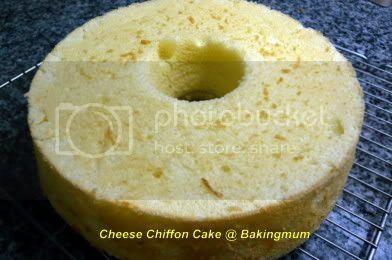 where can i get the cheese chiffon cake recipe ya? coz i can hardly collect all of his recipe book. can you share the recipe? I am also fans of Alex Goh. I have this book too. I will try using the leftover cream cheese in my fridge. Thanks for sharing your cake pixture, look good. You are really one hard working mama ... still baking after 9pm! I would have been dead tired by then. I will post the recipe up shortly. It is worth trying out this cake as it taste like those Light Japanese Cotton cheesecake. kudos LeeLee, your baking skills are amazing and your tireless stamina admirable. hello! i just found your blog today and im really inspired! im just 21 but i want to be a great mom like you in future baking for my family. continue doing your best im sure your children enjoy it so much! I have made the cake last weekend but it come out not like your cake so high & soft.Just to ask u for the step 3 the egg york should I mix with the electric beater?or just hand stir? Hi Lilian, I used a hand whisk to mix the egg yolks. No need to use machine to whisk. If you want a softer cake, try to use cake flour or hongkong flour or top flour. Hi missy, yes do give it a try and let me know if you like it. This looks delicious and fluffy as a cloud :). can i ask about the step when u add the flour to the egg/cheese mixture? when i add the flour, the egg/cheese mixture becomes very dry and lumpy.. it is not smooth or in liquid form and clumps together. why is that so? i have measured the milk, butter, cheese contents correctly. i also find melting the cream cheese to be difficult cos there are still many small lumps left after putting it on the double boiler..
Hi Geral, how long did you melt the cream cheese in the milk and butter. Remember to use room temperature cream cheese. Usually I let it sit outside for about 30 mins or more if it is just taken out from the fridge. It helps in the melting process. Try using a small whisk to whisk the lumpy cream cheese while it is double boiling. From what you have described, it seems that you cooked the cream cheese too long and the liquid has been reduced. Next time if you see the mixture lumpy and dry, you can add some more milk to it. Hope this helps. 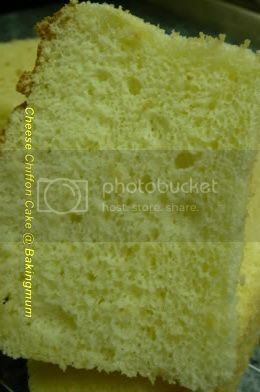 Hi Adeline, beating of the eggwhite is very important for chiffon cake. Did you beat the eggwhite until it is peaked, ie. you overturn the bowl the eggwhite will not drop out. If you followed the recipe exactly, it gives you a very smooth, very soft and fluffy cake. To me it doesn't matter if the egg is at room temp or cold. But if you like you can leave the eggs outside to reach room temp before you use them. The eggs I used is the big one, about 75-80g with shell. Adeline, to get a softer texture cake, you try to use cake flour or top flour instead of plain flour. It should be better. Thanks hug bear,at least i'm more confident in my next attempt. Prior to this, i was wondering whether the recipe given in the book can be trusted or not? I've tried three times and each time turned out to have funny shape. It has became my trademark already... ha ha ha.. ll try and let you know. hello...i posted your recipe on my blog as i found it very nice...thanks for the suggestion on the recipe...please feel free to visit my blog at http://welpenoink.blogspot.com/ and then please comment too...thanks! Hi welpenoink, I will definitely visit your blog. 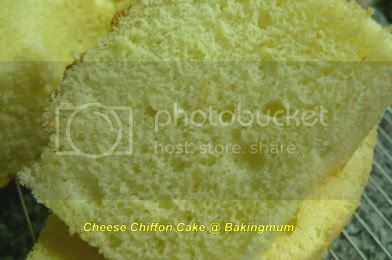 Noticed the recipe did not hv the baking powder for this cheese chiffon cake. I tried one other chiffon recipe the other time without baking powder, it rose to the top but when it's baked and I overturned the cake, it collapsed. So now whenever I bake any chiffon cakes, I will usually add in 3/4 to 1 teasp of baking powder even recipe did not call for... Can I add into this too ? Thanks and hope to hv yr reply. Sorry, one more question, I hv a packet of semolina flour, can I know what can I bake using this flour ?? Trying to do something with it before it expires. Catherine, you can use it to make bread or sugee cake or sugee cookies. Catherine this recipe did not call for baking powder because the eggwhite and egg yolk are beaten separately. The eggwhite gives the cake its volume like any other chiffon cake. But it is ok to add baking powder if you like. MERRY XMAS AND HAPPY NEW YEAR TO YOU AND YR FAMILY ! Thanks so much for the prompt reply. I will try to find the sugee cake or cookies recipes. Thank you for the recipe.This recipe is simple plus is so delicious,my family love it!I just modify a little bit the flour insist of using 65gm of plain flour,I use 50gm plain flour plus 15gm of cornstach. I noticed that there is no sugar added to the egg yolk mixture, is this correct? I'm eager to try out this recipe, tks for sharing it! Sorry to bug u for a response but i'm v eager to bake this chiffon :) can u pls confirm that no sugar is needed for the egg yolk mixture? Tks so much! Yes, it is correct. The sugar is only added to the egg white. Tks Hugbear! In fact I've gone ahead to bake this in the morning b4 reading yr reply :) Sadly, it did not turn out too well, the top of the cake rose unevenly in the oven, then collapsed! When i overturned the cake after baking, the collapsed portion (@ the bottom now) is dense, not fluffy :( though the taste is yummy! I'll definitely try again cos my kids love it! If your eggwhite is ok, then I also don't know what else is wrong. How did you mix in the eggwhite into the yolk mixture? Really don't know how to advise you. The yolk already mixture with the cheese. Follow by using rubber spatual to scope egg whites into cheese mixture. Then fold in well then add the balance one . Sounds ok and correct steps to me. Tried four time still not rise n fluffy at all.Haiz so upset. Later Im going to try for the fifth times. Do you know any place conduct lesson for chiffon cake? I will like to try this out tomorrow. Do I need to oil the pan? Thanks! No need to oil the pan. used top flour and added half a teaspoon of baking powder. the cake turned out so soft, fluffy and beautiful. do you think i can add more cream cheese? how about substituting fresh durian pulp for cream cheese. will it still taste good? Hi Emily, it's ok if you don't have a double boiler. Just use a smaller pot fill it with water and bring to a simmer. Place another bigger pot over the smaller pot or a glass or metal mixing bowl that is bigger than the one below. You can use this method in place of a double boiler. I made this cake today but I found the batter to be very little and when I pour in my cake pan it's very low. After baking, size of cake is like 1/3 of yours. But the texture is very soft and like a chiffon cake. Should I use a smaller cake tin?